We are starting the fourth week of BM#60 with “Healthy Diet/ Diabetic Diet” as the theme. If you have noticed, I have a huge collection of Diabetic Diet Recipes. It mostly started because Daddy wanted to make the Diabetic Diet more understandable to a layman and wanted me to suggest options that will easily work out for a person who is planning on controlling their Diabetes. Healthy options makes a diet more interesting and also gives more choice to a person who might otherwise feel depressed in not have much to select from. These healthy recipes work for not just diabetic conscious people, it works out best for those who want to be aware of their regular diet as well. So its been my ardent wish to experiment with different foods that will help in this area. Millets have become the latest favourite to all, though its been used quite frequently in our home. 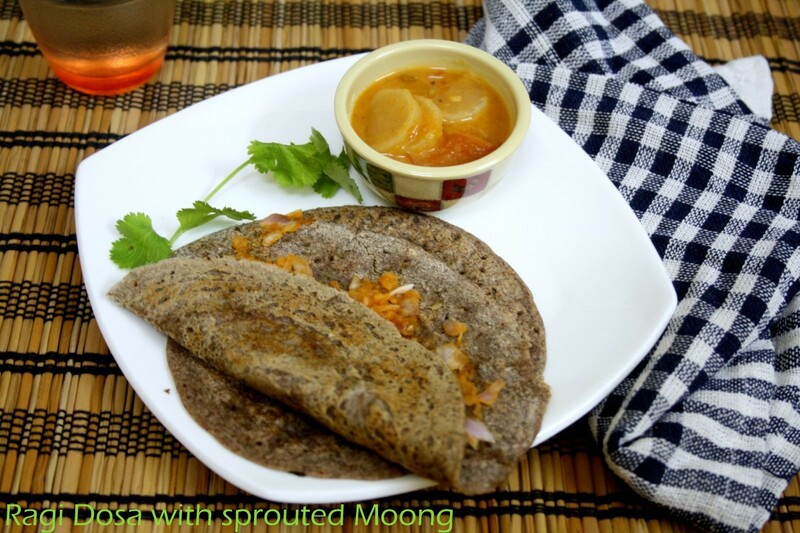 In today’s recipe, I have used sprouted Moong and Ragi flour to create a quick, instant breakfast that’s ready under 15 minutes. Yes this does mean you have sprouts on hand. As part of my Diet plan, sprouts have always been integral part of the diet. So some sprouts are always available. Sprouted Moong are so delicious as such and it forms a wonderful fibre and filling component in this dosa. As one might expect, being a south indain, dosas are the best form of breakfast. You will be satisfying that part of yours by digging into these pancakes. Come, join us for Breakfast with these delicious healthy pancaks. Sprout the Moong as you normally sprout an bean. Refregerate until usage. In a mixer, take the sprouts and ragi flour, salt. Pulse for couple of times. Add water as required. Heat a tawa, grease with little oil and pour a ladleful of batter. If you are making mini dosas, don’t spread much. I never thought of this cmob for dosas. Healthy and filling breakfast for everyone. Fantastic dosas, absolutely nutritious and highly inviting. 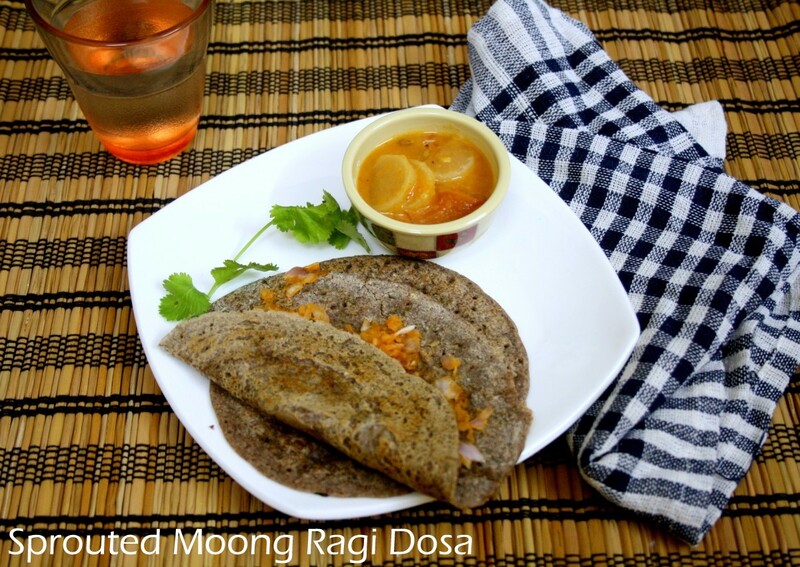 Moong and ragi sounds like unique combo.Very healthy dosa. Sounds a little like ragi pesarattu! Healthy indeed! I've made moong dal dosa and ragi dosa separately. Never thought of combining them.Innovative. 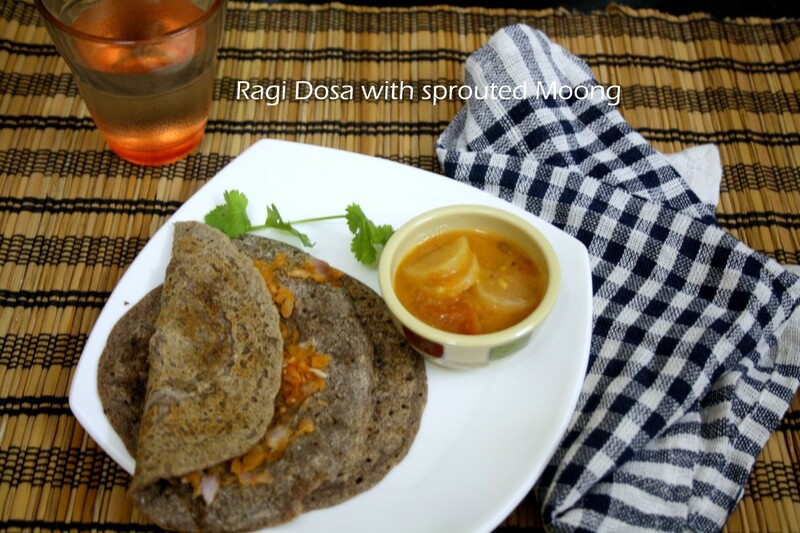 Love this sprouted moong dal and ragi dosa. So healthy & filling. simply awesome, dosa looks so delicious. Wonderful idea , must try for hubby , he will surely love it . Perfect for my son's tiffin box. This is a nice power packed dosa. Healthy start to a day..